In a very bad match that only deserved a 0-0 at the end it was (of course) A.C. Milan that kept the 3 points. In the 76th minute just after Delneri had substituted Moretti (why?) it was Abate in offside-position who gave the assist to Stephan el Shaarawy (ex-Genoa): 1-0. Genoa played a very bad match and only had some long distance shots that didn’t worry goalkeeper Marco Amelia. In the offensive way Genoa played a very poor match without Marco Borriello. Especially Tozser and Bertolacci seemd impressed by the San Siro stadium and forgot to play football. Let’s hope Thursday against Fiorentina we can see a real football-match, certainly with more offensive football. Within 24 hours Enrico Preziosi did find a new trainer to subsititute Luigi de Canio: Luigi Delneri. 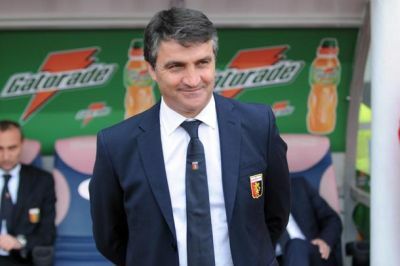 The former coach of Sampdoria and Juventus signed a contract till the summer of 2014, but it will be a surprise if he still we be our trainer in June 2014. The new coach has tot start without Vargas and Borriello who both are heavily injured till the beginning of December (so after the derby). What a fantastic start of Genoa against Roma. Within 15 minutes we scored twice with fantastic goals of Kucka and Jankovic, after Bosko first hit the crossbar: 2-0. But after 15 minutes it was over, Genoa only defended and seemed very scared of A.S. Roma that scored twice before halftime: Totti and Osvaldo and twice after halftime: Osvaldo and Lamela: 2-4. One day after the match trainer Luigi de Canio was fired by Enrico Preziosi. Is it because of the last 75 minutes of the match against Roma or for another reason ? Again a draw: 1-1, with again a goal of Marco Borriello. Genoa played a good match against the team of Mr. Gasperini the coach who brought us in Serie A and in the Europa League. With Palermo our Gasperson plays attractive and offensive football, so it was a very nice match with two teams trying everything to win. Palermo took the lead in the first half by a goal of Giorgi in the 14th minute. Especially Ciro Immobile had several changes to score our equalizer, but he missed. In the 53rd minute it was (again) Marco Borriello who scored our equalizer after an assist of subsitute Jorquera. Also after the equalizer both teams did everything to score the winning goal, but at the end the honest draw of 1-1 still was on the scoreboard. The next match is Sunday 22nd October at 20.45 hours in Marassi against A.S. Roma. Can a match be boring, yes it can! Of course we have to be more happy with the draw in Udine then with the defeat in the very spectaculair homematch against Juventus, because at the end only the points count. Saturday-evening at 20.45 hours we play at home against Palermo of Mr. Gasperini, so both teams will play attractive and offensive football! Of course we also want 3 points Saturday to stay on the left side of the standings.